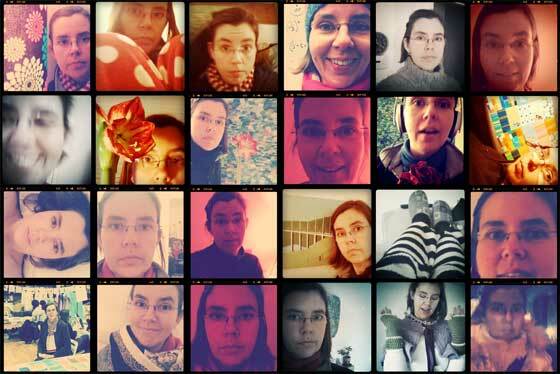 Another 24 days have passed since my last 365 Days project post and here are my next 24 self portraits. This week I have started using the Project 365 iPhone app to help me track my process. it is working very nicely. I can imagine that the project might just carry on, it would be amazing to continue until I’m 70 or 90, slowly seeing the changes roll in. I am thinking about that…. Hooray you made another set! I am filled with wonderment that you managed it! I’m looking forward very much to the next set, and the next set, and the next set, and the next set…. Hooray, indeed! I have to admit I have put a double daily reminder in my phone to keep me on track. But actually I am really enjoying it and there is satisfaction in uploading each batch. Glad you are liking it too. you are so very, very talented. You seem so happy and your new work is absolutely beautiful. Best wishes to you always. P.S. I found you when I was looking for some images from my past to put into a collection for a project at uni.